4 Bedroom Detached House For Sale in St. Austell for £600,000. This fantastic coastal residence is presented to the highest standards throughout and is offered to the market for the first time since significant extension and improvement plans have been carried out in recent years. This superb spacious family home provides light and airy accommodation over two stories with the main reception room combining the living area, dining area as well as the kitchen which makes for a fabulous entertaining area or a family hub. The property is entered via a newly added large porch which provides access to the spacious entrance hallway with a bespoke hand built staircase immediately on your right providing access to the first floor. As mentioned above the main living accommodation comprises of an open plan sitting / dining / kitchen area which features a focal wood burning stove making this a real feature of the room. The kitchen area itself is neatly tucked behind a central island which could double up as a breakfast bar if required. Large windows to both the front and rear of this room flood the area with ample natural light. Glass and oak doors lead to a spacious sun room which provides outstanding sea and coastal views. The current vendors use this area as a formal dining room with a seated area to one end. This expansive room has a multitude of uses and is a perfect addition located off the main reception room. Completing the accommodation on the ground floor are two large double bedrooms and a family bathroom. At first floor level the spacious landing is currently being used as a study area but would lend itself perfectly to additional uses such as a library or child’s play area. On this level there are 2 bedrooms both of which provide en suite facilities. The master bedroom is of generous proportions and again provides a triple aspect outlook with the main focal window enjoying far reaching views across the village and over the sea and coastline. In addition there is a separate dressing room and en suite located behind the bedroom. Externally the property is wrapped by its own gardens mainly laid to lawn. There is driveway parking for 3 cars in addition to an integral garage and carport alongside. At the back of the carport is an enclosed utility room with its own external door with power, lighting, enclosed WC and water connected. 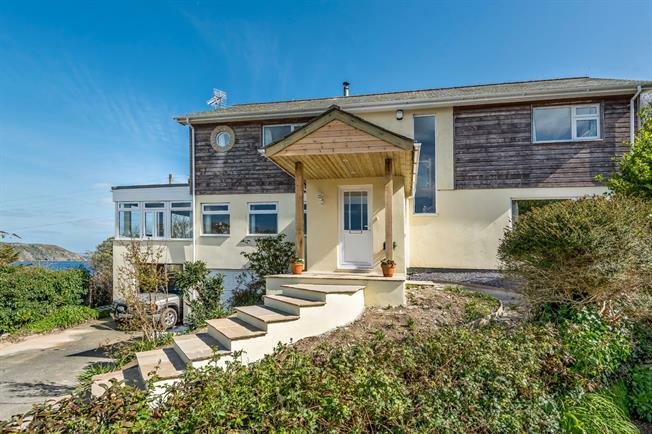 Set in this sought after traditional Cornish coastal village with a sandy beach and stone quay, the property is within walking distance to National Trust coastal paths and the harbour. Gorran Haven is renowned for its lovely beaches and spectacular coastline. The village itself has amenities catering for everyday needs including shop/post office, seasonal beach cafe and doctors surgery. Gorran Primary School is approximately 1.5 miles away. The working fishing village of Mevagissey is approximately 3 miles away. Mevagissey is an attractive old town which was once the centre of Cornwall's pilchard fishery and which still boasts a working harbour. It has a tradition of boat building dating back to 1745. Many of the old buildings, constructed of cob and slate, bear testimony to a time when the large shoals of pilchards were the livelihood of the whole village. Fishing trips can be taken from the harbour and there is a ferry to the nearby port of Fowey. In the narrow streets are many gift shops, craft workshops, galleries, cafés and pubs. There are several hotels and many fish restaurants in Mevagissey and, of course, plenty of fish and chip shops! Many of the latter were once the haunts of Cornish smugglers. The following services are available mains electric, metered mains water, mains drainage and telephone line is connected (however we have not verified connection). Combination oil fired boiler providing both the hot water and central heating via radiators on both ground and first floor levels. Superfast broadband is available. From St Austell take the B3273 towards Pentewan and Mevagissy, passing through both villages; continue now following sign posts towards Gorran Haven. After a short distance turn left sign posted to Gorran Haven and proceed down the hill. Continue down the hill heading towards the village main carpark. After a short drive along the road there will be a right hand turning onto a lane called Lamledra Hill. Take this lane and half way up turn left into Quilver Close where the property can be found at the end of this small cul de sac.